Rodeo Drive is probably one of the most famous shopping streets in the world. The street is lined with high profile stores that attract both stars and star watchers. As Laura and I drove down Rodeo Drive looking for a parking spot I realized we were a little under-car’d in our Hyundai rental car. Lamborghinis, Rolls, if it had a big price tag it was parked there. I will admit the fancy cars are beautiful but I have never seen the point in a car that costs as much as my house (or in the case of the Lambroghini, almost double). I would much rather spend the money on travel than waste it on a car that could be totaled in a matter of seconds… but I guess if you have a lot of money – you can probably buy both the car and the travel. We parked our sweet ride in the parking garage and began our walk down Rodeo Drive. 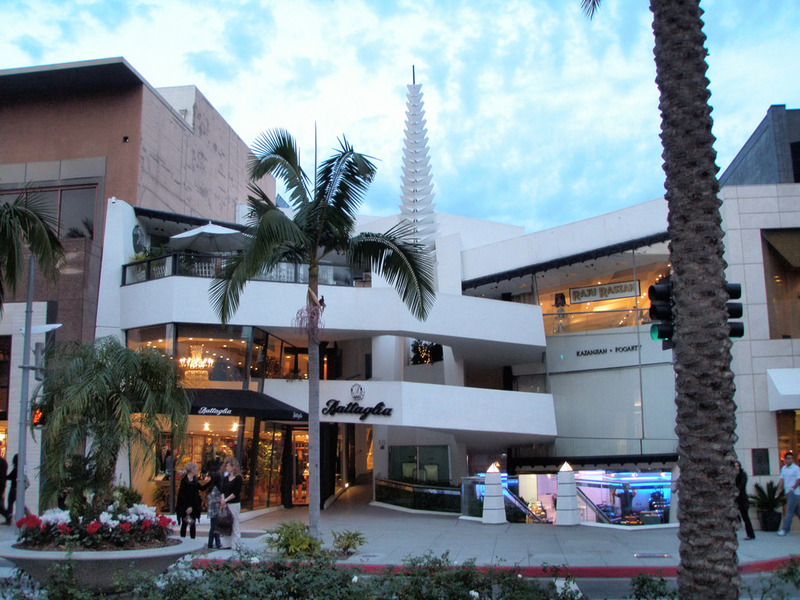 Rodeo Drive’s history goes all the way back to 1906. A typical street filled with hardware stores, gas stations and beauty shops. It was in 1949 that the first official apparel store appear, Carroll & Co, a men’s suit shop. And because it’s me, I have to throw a bit of Frank Lloyd Wright out there. In 1952 Wright built a 3 story shop known as Anderton Court Shops. During both of my visits to Rodeo Drive I was unable to enter the building as the doors were locked 🙁 The building has Wright’s classic Usonian look to it, but I am sure many people pass by there every day without realizing that it is a Wright building. In 1967 the first high fashion boutique, Giorgio Beverly Hills, opened up, but it certainly would not be the last. The street is now lined with the likes of Cartier, Chanel, Dior, Gucci, Prada, Roberto Cavalli, Valentino and Versace to name a few. The street is still filled with impressive retailers but over the years there have been a few non-designer stores that have squeaked their way in among the elite starting with Guess in 1993. There was also a rumor in 2012 that a 99 cent store was planning on opening shop on the drive. It would be a blemish on the street for sure but it did not come to fruition. As Laura and I walked down the glamorous street, looking at the shops and keeping our eyes peeled for a celebrity siting… and then it happened. Laura grabbed my arm and said to me quietly, “OMG that’s Alexis Bellino”… Who? Turns out Bellino was a Orange County Real Housewife. Yeah – so not really a celebrity – but someone on the TV. I’d much rather see a Kardashian if I had to see someone who is famous for nothing. We later saw Bellino and her husband getting their photos taken with fans at a restaurant with quite a crowd around them. I won’t lie – I’ve watched a few of those Housewife shows, specifically Orange County. Usually I watch it when I need to feel better about myself! 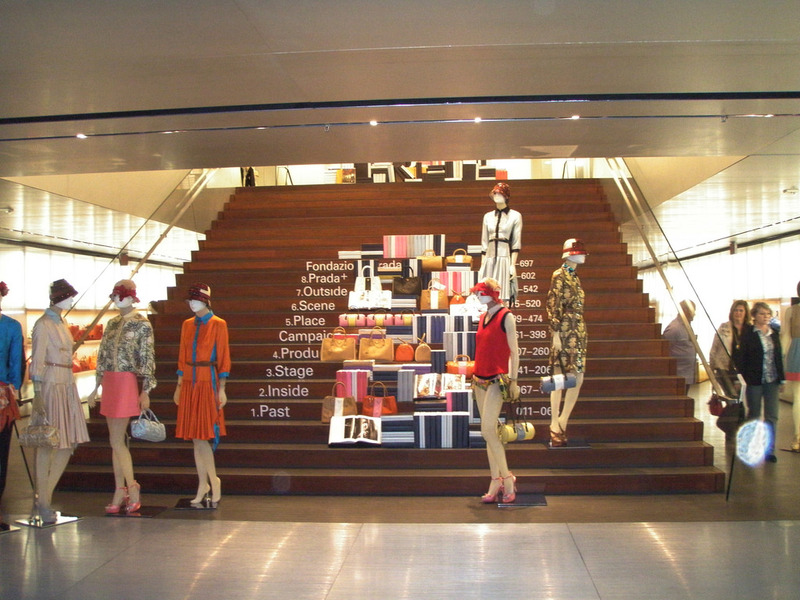 Prada’s store was most memorable for me. 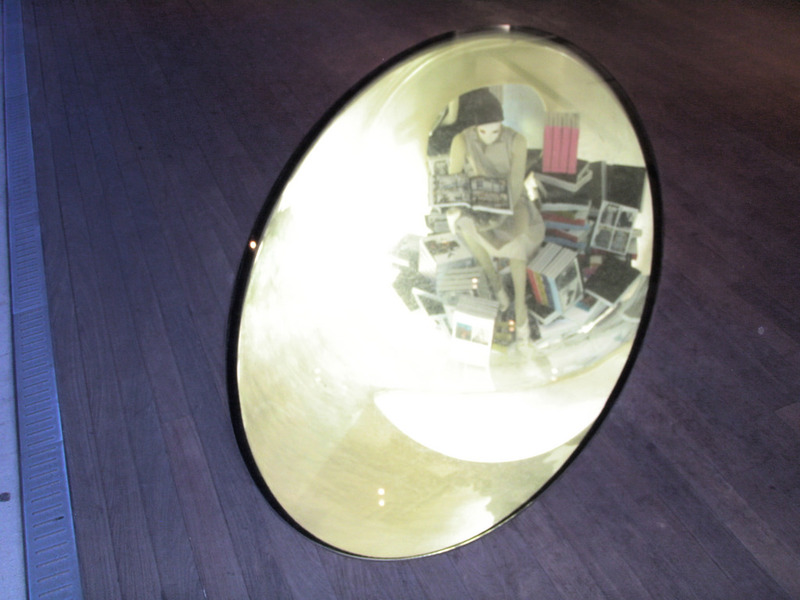 Their entry display was unique as it was open to the sidewalk, not a traditional store front. Laura and I walked up the stairs and quickly turned back around. It was clear we were underpaid to shop in there! the top floor’s the best! Our last stop on Rodeo Drive was at the end of the street where it meets up with Wilshire Boulevard. Now that’s a movie star. 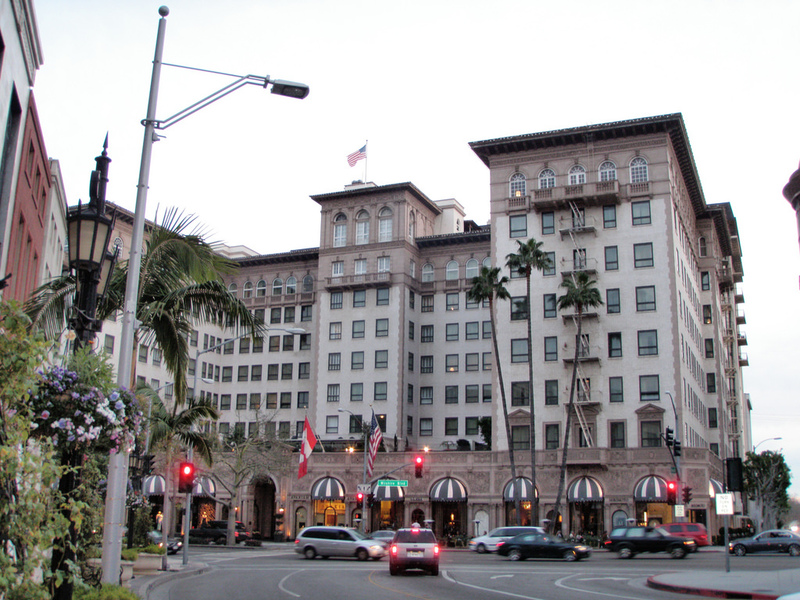 The Beverly Wilshire Hotel, formally known as Regent Beverly Wilshire, from Pretty Woman, also known as “Reg Bev Wil”. 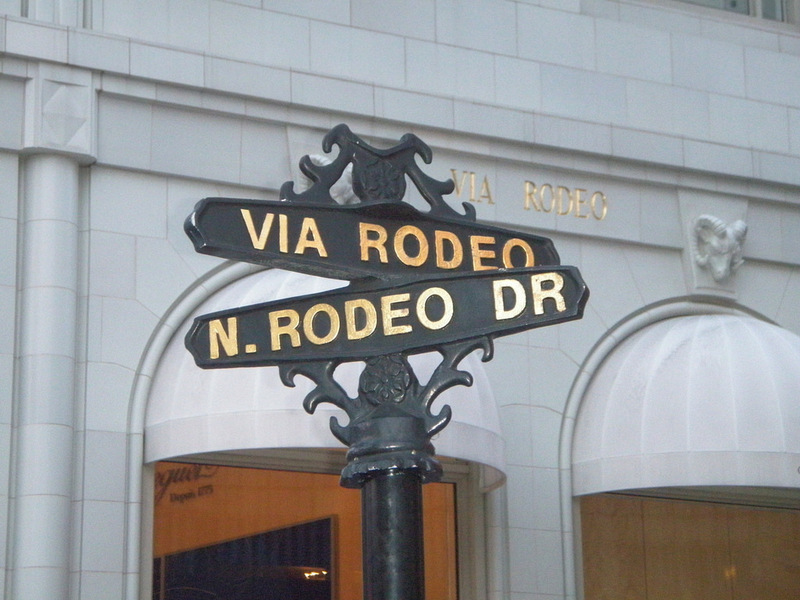 Rodeo Drive is located at 224 N Rodeo Drive. Paid parking garages are located at the south end of the street before crossing S Santa Monica Blvd. Where are the photos of the cars?